The Tanzania Cigarette Company Ltd (TCC) has invested USD30 million (360m/-) in improving efficiency and quality at the company. A TCC press statement issued in Dar es Salaam yesterday says the news was announced at a brief ceremony held at the company headquarters in Dar es Salaam. At the ceremony also were the Japanese Ambassador to Tanzania, Katsuya Ikeda and the President and CEO of the JT International, Pierre de Labouchere. JT International owns a 75% stake in TCC, and is a subsidiary of Japan Tobacco Inc, of Tokyo, Japan, the world’s third largest tobacco company, says the statement. Officiating at the occasion, the Japanese envoy, commended the company for its continued investment in quality and efficiency and training and development of Tanzanians. ’’To effectively compete in the new global economic order companies have no choice but to efficiently produce quality products that can compete in the domestic, regional and global markets,’’ the Ambassador said. He emphasised the need for companies to enhance production efficiencies and product quality by investing in modern technology and investing in human capital through continuous training and development programs. The Ambassador said he was particularly pleased to see that TCC has taken this step and that the new commissioned equipment and machinery will be operated by Tanzanians themselves who have recently returned from training in Europe on how to operate the modern equipment. According to the statement, the newly commissioned equipment and machinery is part of TCC’s USD30 million capital investment program that began in 2005 and will be completed in 2008. Privatised in 1995, TCC is one of the largest agro-based industries in Tanzania, providing direct employment to 670 Tanzanians and indirectly supports over 85,000 tobacco farmers and 2,500 distributors and retailers of its products. The company is also one of the largest tax payers in the country, contributing about 5-6 per cent of the domestic tax revenues. JT International is the majority shareholder of TCC (75 per cent). 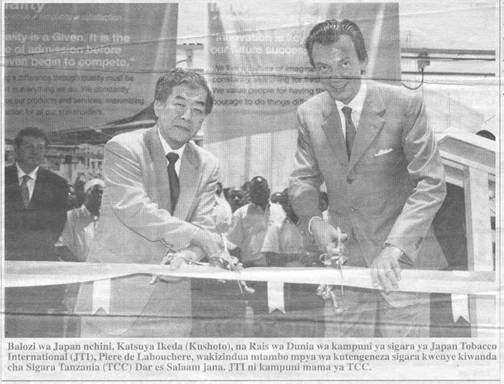 Japanese Ambassador Katsuya Ikeda (left) and World President for Japan Tobacco International (JTI), Piere Labouchere, officially opens a new tobacco making machine at the Tanzania Cigarette Company (TTC) yesterday in Dar es Salaam. JTI is TTC’s mother company.